A Caucasian man with red hair and a beard is holding an iPad at waist level in his right hand, at a slight angle but facing the camera directly. He is wearing a colorful Hawaiian shirt and jeans and is leaning on a bookshelf with a small potted plant next to him. In the background can be seen a small restaurant or coffee shop. This Macbook mockup template provides a great scenario in which you will be able to display your new website or web app in a clever manner that will enhance your visual content while providing an insight to your consumer demographic. This Macbook Pro is set up at a crowded cafeteria in what seems to be a mall or school. 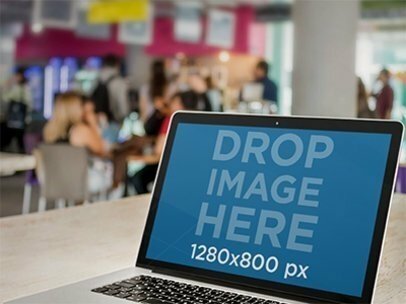 Go ahead and use this laptop stock photo template as a part of your app marketing campaign right away! See more MacBook mockups here! "If you are looking for a creative and effective way to market your new website or android app this multi-device Placeit stock photo mockup template has an awesome vibe and will absolutely capture the attention of your target market. It features both a Galaxy S5 smartphone held in portrait position and a black Asus Laptop in landscape orientation to expertly showoff your new website and/or android app. The scene takes place in a colorful and eclectic art shop and beautifully depicts a sale transaction between a customer and business owner as she uses both devices to complete another successful sale. There are so many ways to make this one your own when you take advantage of one or both device screens. Watch this scene come to life with a custom mockup. Placeit marketing software is always a breeze to use so don’t hesitate choosing this one today." See more Responsive Mockups here! Jump-starting your visual content marketing efforts can be an uphill battle if you don't have the right tools in place to get the job done. At Placeit we are conscious of this and that's why we want to make it easier for you. Use Placeit's stock photo mockups to display your new iOS app or website to consumers and appeal to then right away! 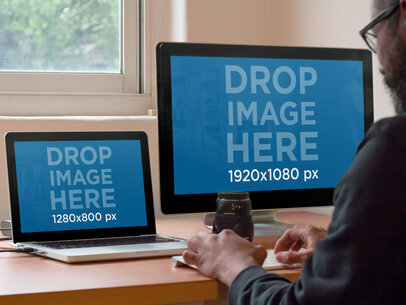 This mockup template features a male designer at his workspace using both his Macbook Pro laptop and iMac desktop computer at the same time. Picture your website being displayed on this image, don't you think consumers would love it if this was part of your marketing strategy? Remember that when you use photo mockups like this your possibilities are endless. To use mockups simply drag and drop a screenshot of your iOS app directly onto the template to create an attractive image which will display your new app within real-life context. 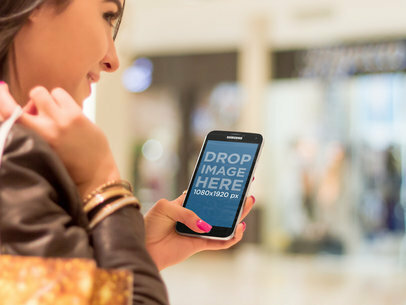 This is a great mockup template which features a young lady using her white iPhone 6 while shopping for home furniture. Mockups allow you to display your app while being used in a real life scenario. By using this iPhone 6 mockup template as a part of your app marketing campaign, you will enhance your visual content. Go ahead and try this compelling iPhone 6 mockup right away and see for yourself! Also keep in mind the negative space in the image, you can add text there! 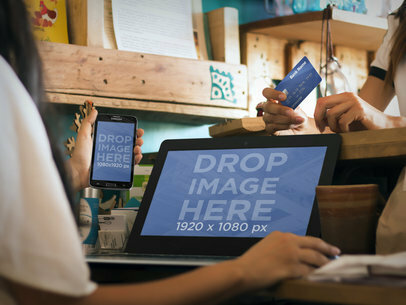 This stock photo mockup is an up-close look at a woman conducting a sales transaction on a natural wood counter with a credit card and a black iPad in angled landscape orientation. 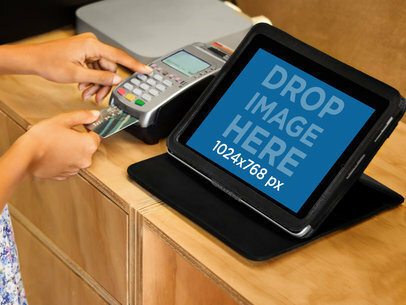 If you’ve created a point of sale app with wireless transaction capabilities then this iPad stock photo mockup is perfect. You can count on Placeit to have the best online marketing tools to help you introduce your new iOS app or web app to the marketplace. Get your potential customer’s attention fast and get started by creating a custom mockup featuring your app on the iPad now. It’s always fast and easy to use Placeit app marketing software to create the perfect look for you. If the sales transaction industry is your target market then this Placeit stock photo mockup is an essential asset to add to your marketing strategy. This Placeit stock photo mockup works overtime to frame your new website or web app in eye-catching refinement. Explore this one and you’ll see so many elements at work here to make you look your best. 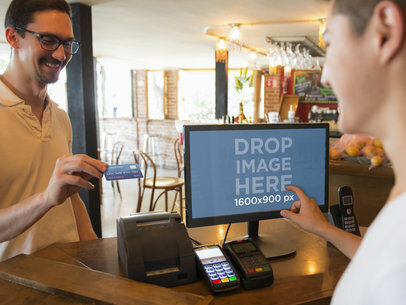 It features two young men conducting a payment transaction in a restaurant setting using your new web app on a black LG monitor. The ease of this scene really punctuates how vital your new web app is in completing a pleasant sales transaction. 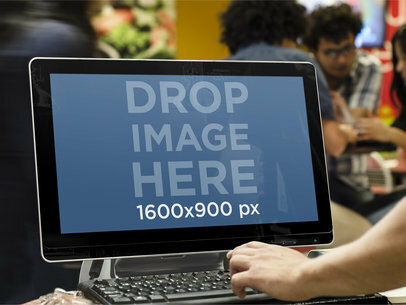 Peak your target market’s interest with this Placeit stock photo mockup. If you think this may work for you then don’t hesitate to try a custom mockup now. Simply drag and drop your desired screenshot onto the screen in the template or import a screenshot from a URL by clicking the "Grab Screenshot From URL" button and type in the URL so Placeit can do it for you. It’s always fast and easy to use Placeit marketing software so get started today. See more Windows mockups here! A girl, wearing a multi-colored sweater, looks at her iPhone 6 while shopping. The store she is at has brown undertones that contrast perfectly with the colorful sweater she is wearing. She smiles as she looks at&#8230; your app or design! This iPhone 6 mockup is ideal for any commerce, fashion or even social app. Her natural stance and smile really make this a perfect iPhone 6 mockup to show your app in context. Want to take your visual marketing strategy to a new level? Then, use this attractive, every day life scenario and allure consumers at a glance! This beautiful stock photo template features a breakfast scene were a black iPad is lying on a wooden table in an angled portrait position next to a plate of waffles and a cup of coffee. This image is the perfect way for you to introduce your newest iOS app or website into the marketplace. To start using Placeit's stock photos all you need to do is choose an image of your new iOS app/website and upload it onto the template, or simply input the URL so Placeit can do the rest of the work for you. This beautiful iPad mockup will definitely work to display any kind of app or website, so don't wait any longer and start using it right away! This pretty young female spa therapist is so happy she’s found your new iOS app to use on her white iPhone 6 Plus smartphone. Here we see her at work in a spa and holding up a white iPhone 6 Plus smartphone in portrait position to access your new iOS app. Bright white sterile therapy chair and equipment fade into the background as she happily scrolls through your app on the smartphone. Did you create a new appointment scheduler, procedure tutorial or product purchasing app? It’s time to introduce it with style and sophistication. This stock photo mockup can appeal to your specific target market and leave a lasting impression in an instant. It caught your attention, didn’t it? It’s time to get professional marketing tools that work hard for you so click through and create a custom mockup now. This compelling Placeit iPhone 6 iOS app stock photo template is the perfect scene to showcase your new iOS app in a realistic, true-to-life scenario. It features a cashier working a transaction with a customer at her counter while displaying your new iOS app on the cashier’s black iPhone 6 smartphone in portrait position. 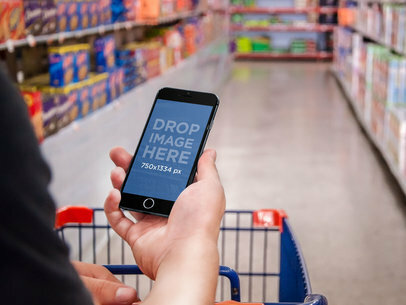 If you’ve created an iOS app for the retail industry or business owner then it’s time to tailor your marketing strategy and appeal to your specific target consumer with this authentic Placeit stock photo template today. Show the world how you’re app is revolutionizing the common transaction. Create a custom mockup with Placeit’s convenient app marketing software. All you need to do is upload your own screenshot of your app or input the URL so we can do it for you and you’re quickly on your way to outstanding marketing appeal with Placeit. 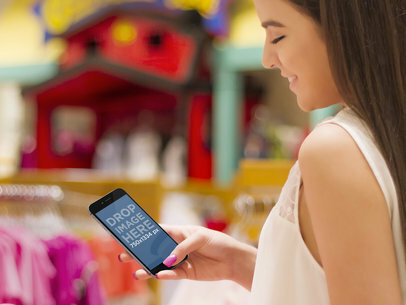 A woman, wearing a colorful sweater a gold wristband and pearls, holds her iPhone 6 while she shops at an elegant store. This iPhone 6 mockup has a beautiful golden background, with soft reflections, that accentuates the modern black phone. 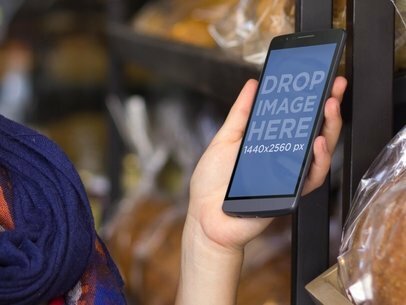 If you have an ecommerce app, you can drop an image to get started. 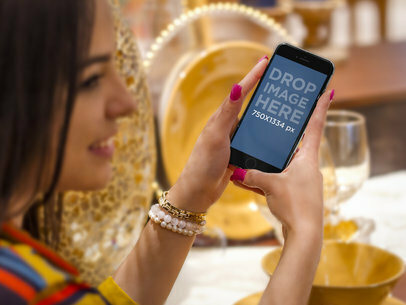 However, this iPhone 6 mockup would also go well with any social app, as the woman is chatting with someone off-camera. Use stock photos from Placeit marketing tools to upgrade your marketing strategy today! This laptop mockup features a businessman at a restaurant using his Macbook Pro. While he waits for the waitress to bring him his food, he accidentally comes across your new website and instantly falls in love with it. Wouldn't you love displaying your new iOS app or website to potential consumers in such a relatable way? The main focus on this image is the screen of the laptop, which is perfectly positioned for your marketing needs. To use Placeit's photo mockups, just simply upload a screenshot of your choice onto the MacBook in the template, or input the URL so Placeit can do it for you. Choose this attractive stock photo and take your visual marketing strategy to the next level right away! Display your app on this black iPhone 6 mockup held up by a person at the supermarket. They are strolling through the cereal aisle of a local store. The iPhone 6 mockup is being held up in portrait view. The mockup holds an image of 750x1334px. This would make a great place for a list making app. The iPhone 6 rests at the counter of your favorite bar. On the top left a glass of beer stands in all it&#8217;s glory ready to drink. On the top right a credit card scanner is ready to take payments. The iPhone mockup is set to portrait view. It holds an image of 750x1334px. Managing a restaurant can be a stressful task to cope with, that is why there are hundreds of different restaurant software options, as well as web and desktop app to save the day and help drive business to a rapid growth. 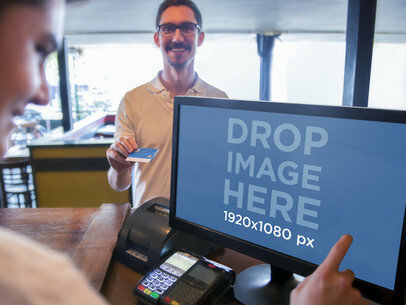 This mockup template features a PC desktop being used at a restaurant cashier machine; the place seems crowded which is a good indicator of business success, and that is exactly the idea you are aiming for. All you need to do is just drag your screenshot of your software or web app, or simply type the URL of your website to create a beautiful PC mockup in seconds. After downloading your PC mock-up template, you will be able to share the end result image to provide your potential users and clients with a real insight on your design and features. Use mockup templates as a part of your app and online marketing strategy, try it out now! Make your app sell instantly with ready to customize digital mockups! This Android phone mockup is great to try your latest app interface, go ahead and drop your image over the placeholder and get your download in seconds. App marketing doesn’t have to be complicated or boring when you have Placeit’s mockup generator. See for yourself! To see another Android Mockup click here! Need an eye-catching marketing tool that showcases your new iOS app in a true-to-life scene your target demographic can relate to? Then look no further than this beautifully designed stock photo mockup from Placeit marketing tools. It is a polished and elegant look at a female spa technician using a white and gold iPhone 6 Plus smartphone she holds in portrait position to scroll through your new app during a day at work. Whether she’s exploring the hottest beauty products, scheduling clients or discovering new procedures, the possibilities to take her career to the next level are limitless when she has your app at her fingertips. Don’t hesitate to take the next step to stepping up your marketing plans and see this scene at its best with a custom mockup now. Just upload a screenshot of your new app onto the template or input the URL so Placeit can do it for you and get on your way to turning heads. This is a Samsung Galaxy S5 mockup that presents two women using the device at the mall, one of them is holding the Samsung Galaxy S5 mockup and shows it to her friend while they enjoy a good time. This is a great stage to show your app for a casual and social response; the image is bright and clear, so anything you add to it will look just as fresh and fun. More Samsung Galaxy Mockup Templates here! Young mom goes shopping while holding new iPhone 6 mockup that displays your website or app in portrait. This is a great iPhone 6 mockup as it provides a warm high tech context. If you have a shopping app, a baby-related app or similar, use this mockup to showcase your design in context. A man chooses from one of dozens of suits at a clothing store in this HTC One mockup. The setting is cold and professional. This modern image would be perfect for any small business, stocks or fashion website. You can also use it for your app, by dropping a screencap in 1080&#215;1920 px aspect ratio. This HTC One mockup also goes well with bright, colorful designs, as the darker surrounding would help bring them out. 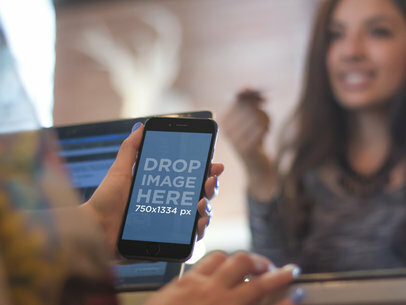 Use this iPhone 6 mockup being held up by a pretty girl to show off the best of your app. She is looking for the perfect outfit at her favorite boutique. She is holding up the iPhone 6 in portrait view. The iPhone 6 mockup holds an image of 750&#215;1334. This is perfect for a shopping app. Placeit has got everything you need to showcase your newly released iOS app to the public in a fresh, fun way. 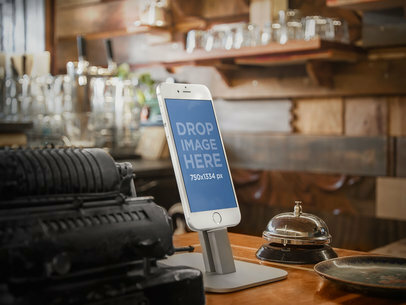 Get straight to the point with this iPhone photo template, all that's missing is an image of your new iOS app or website. In this photo mockup we can observe a woman at a furniture buying some home decor. Use this real-life situation to relate to consumers and make your product more desirable. Placeit stock photos are really simple to use, all you need to do is drag and drop a screenshot of your new iOS app directly onto the iPhone's screen or click on the "Grab Screenshot From URL" button above the photo and type in the URL and we'll can do the rest of the work for you. Choose Placeit as your new marketing strategy and make the most out of your new app/website today! Portray your latest iOS app within one of Placeit's iPhone mockups and showcase its features and design to your prospective clients. To customize one of our iPhone mockups, all you need to do is drag and drop a screenshot of your app onto the template of your choice and within minutes Placeit will deliver an image ready to be added to your visual campaign right away. So what are you waiting for? Make iPhone mockups the latest addition to your marketing tools today and start enjoying outstanding visual content immediately! To see more iPhone Mockups click here! 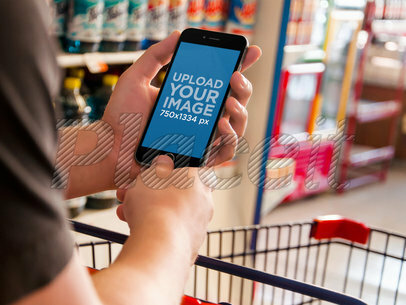 This iPhone photo mockup features a young woman using her brand new white iPhone 6 while shopping for groceries. She holds her phone in an angled portrait position. This scenario will allow you to present your new iOS app to your clients in a real-life situation. The position of the phone's screen allows your new iOS app to be the center of attention in this photo. By using mockup templates as part of your app marketing strategy, you will definitely enhance the overall perception of your prospective customers. To start using Placeit all you need to do is drag and drop a screenshot of your new app straight into the iPhone's screen, or simply type your URL above and Placeit will do it for you. Photo mockups are a great way for you to upgrade your marketing strategy. Go ahead and try it out right away! What kind of android app or mobile responsive website do you need to promote? A fun shopping app? A cool new social app? Maybe you've created a great way for people to transfer funds or pay for things online/in-store? Perhaps you have an app that allows people to share photos or chat face-to-face? Whatever you've created, you need an app marketing tool to help spread the word about it. And that's where Placeit's mock-up templates and videos come in. 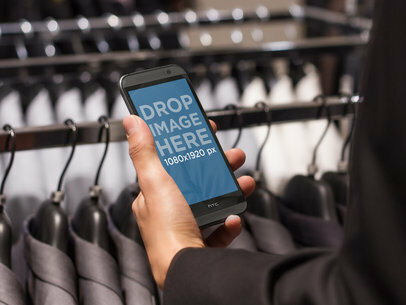 Firstly, you pick out an android mock-up, like this one for example, it features a young man shopping in a clothing store. He's holding a beautiful Samsung Galaxy S5 in his hands and he has a big smile on his face. So, you can tell he's loving whatever is on that large screen of his Galaxy. How great would it be if it was your android app that has him smiling? Well it can be, because once you've chosen this scene, you'll drag a screenshot from your android app onto the Galaxy's screen, then this young man will be using your app with that huge smile on his face. After you've created your mockup, you can download the template and your app marketing tool, will be all ready! A girl walks around the mall while holding a golden purse on one hand and a Samsung S5 mockup on the other. Her smile indicates she loves using&#8230; your app or website! For this Samsung S5 mockup in landscape mode, you can upload an image that is 1080&#215;1920 px in size or choose a URL. It will work better if it&#8217;s a mobile-optimized website. If you have an instant messaging app, or any casual use app, this stage is for you. In this Samsung Galaxy S5 Mockup, you can see two friends using their phone while shopping at the mall. One of them carries a sparkly bag, the other an S5 Mockup. 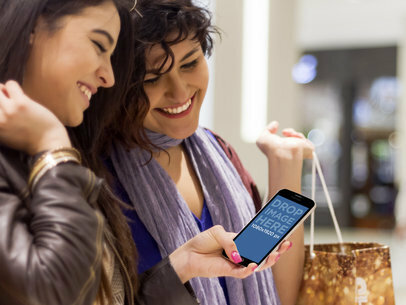 If your app or website is designed for casual use and you&#8217;re looking for an android mockup, what better than to show it in a nice mall with two girls smiling and having a good time? Ready for you to drop a 1080&#215;1900 px image to get started. 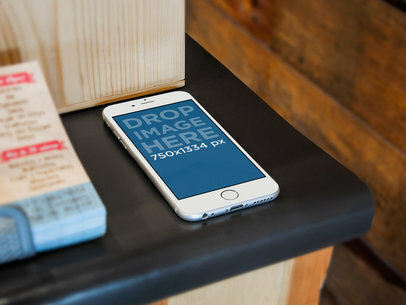 Place your cool small business app in this iPhone 6 mockup at a vintage store. You can give any app a unique vintage look with this mockup. The iPhone 6 rests between a type write and old style hotel counter bell. The iPhone 6 will hold an image of 750x1334px. This is a great place for an app with an indie style design. 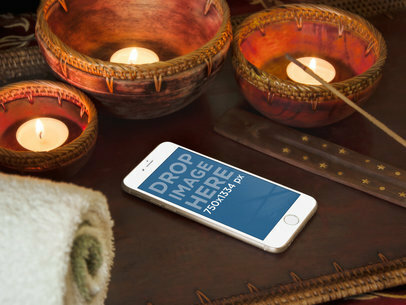 Set up your app in this iPhone 6 mockup at a spa. This relaxing iPhone 6 template is a great place to show off an equally ambient app. Use the colors to your advantage to complement your app. The iPhone 6 holds an image of 750x1080px in portrait mode. 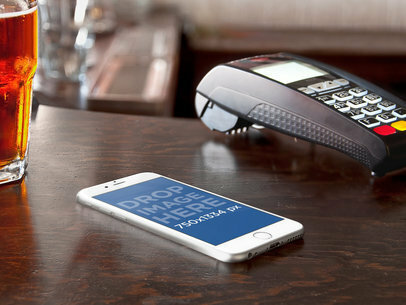 A white iPhone 6 lays on a dark counter top at a small business. The iPhone 6 is set next to a stack of flyers. The iPhone 6 is in portrait view and holds an image for 750x1334px. This is great for any sort of app mockup. Don’t get lost! Create a powerful presence, stand out and claim your spot in the saturated marketplace with Placeit professional marketing tools. This industrial stock photo mockup has a lot to offer. 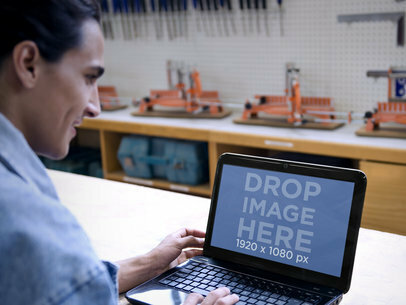 Featuring a mechanical engineer in his industrial workshop while using your website on a black HP Laptop and a colorful background perfectly depicts the specific target market you aim to appeal to. If you’ve developed a new website and need a tailored stock photo mockup to advertise it, then this is absolutely the template that can handle the job. See how it’ll look with your website displayed on the HP Laptop now with a custom mockup. All you have to do is drag and drop your desired screenshot onto the template or import a screenshot from a URL by clicking the "Grab Screenshot From URL" button and type in the URL so Placeit can do it for you. It’s always fast and easy to use Placeit marketing tools so get started today. Frame your new web app in stylish sophistication. Choose this Placeit stock photo mockup template and choose to leave a bold and lasting impression on your target market with a simple glance. 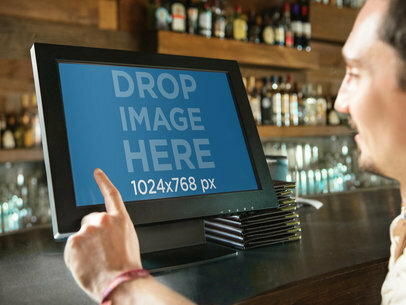 This one artfully features a handsome bar in the background as a bartender enters a sale order using your new web app into a black monitor touch screen. If you’ve created a new point of sale web app then this is the perfect frame to showcase all it has to offer your potential customers. 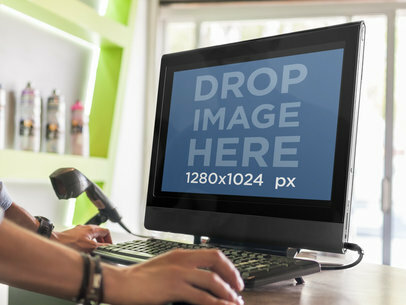 Compelling and innovative marketing tools are at your service so try this stock photo out with a custom mockup featuring your new web app on the monitor. Just upload a screenshot of your website or web app onto the monitor or input the URL so Placeit can do it for you. Placeit app marketing software is always convenient to use so don’t delay, get started today. This energetic scene features a young man in a garment shop handing his credit card to the cashier to complete a purchase. A large black PC monitor shows off your new web app as the shop fades into the background. The ease and pleasantness your web app provided for this transaction is evident on the customer’s smiling face. 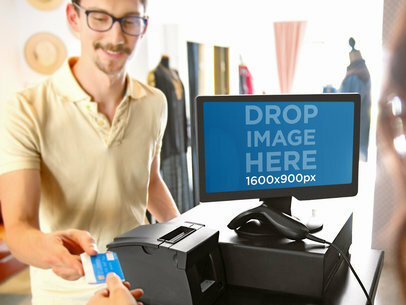 If you’ve created a new point of sale web app then this is the perfect way to promote it in polished elegance. This bright and beautiful true-to-life scenario will demand the attention your new web app deserves and leave a lasting impression on your potential customers. Try this stock photo template on for size with a custom mockup now. Simply upload a screenshot of your website or web app onto the monitor or input the URL so Placeit can do it for you. Creating a polished and professional marketing tool is only a click away. This winning stock photo template is the perfect marketing tool to show off your new web app. It features a cashier completing a successful sales transaction for a male customer and using your web app to accomplish it on a black PC monitor. The pleasure and ease of this customer’s interaction is evident and the message that your web app is a must have translates perfectly to your audience at a simple glance. See this scene at its best with a Custom mockup now. It’s fast and easy to do. All you have to do is drag and drop your desired screenshot onto the monitor in the template or import a screenshot from a URL by clicking the ""Grab Screenshot From URL"" button and type in the URL so Placeit can do it for you. Look polished, relatable and professional when you trust Placeit to take your marketing strategy to the next level. This dynamic iOS app marketing stock photo mockup has a really cool vibe. It features a pretty young lady leaning on a polished wood bar while a cashier completes her sale transaction on a MacBook Pro 15” Laptop in angled landscape orientation. The pleasantness and ease your new point of sale app afforded this interaction is evident in the young lady’s smile. Choose this Placeit MacBook Pro 15” Laptop stock photo mockup and frame your new iOS app in an intriguing and memorable scene your target market won’t soon forget. See your app on the MacBook now with a custom mockup. Simply drag and drop your desired screenshot onto the screen in the template or import a screenshot from a URL by clicking the ""Grab Screenshot From URL"" button and type in the URL so Placeit can do it for you. Outstanding marketing appeal is only a click away when you choose Placeit marketing tools. If you’re ready to take your marketing strategy to a professional level then this is the stock photo template for you. Here we have a pleasant scene of young lady working an outdoor fresh fruit market and using a black iPad in landscape position to execute a successful sale transaction for a young male customer. The process is a breeze all thanks to your awesome new iOS web app they are as happy as can be. 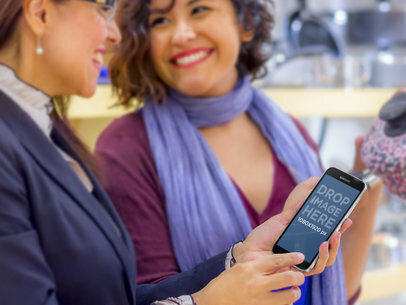 Nobody likes needless complications or wasting their time and your app can bring this kind of ease to so many merchants in need of wireless sales solutions. Show off all you have to offer with this bright and beautiful Placeit stock photo template by getting a custom mockup now. Just drag and drop your desired screenshot onto the iPad screen in the template or import a screenshot from a URL by clicking the "Grab Screenshot From URL" button and type in the URL and Placeit will happily do it for you. Outstanding marketing appeal is only a click away with Placeit marketing tools. See more iPad mockups here! It’s time to show off your new website or program with this stylish HP Desktop PC marketing template from Placeit. This cool scene gives us a look behind a busy retail counter and it’s no surprise this smart business owner has chosen your website or program to keep up with their busy workload. He could be ordering new product, taking inventory or placing a customers’ order on the black HP flat screen in landscape position. Whatever your website or program has to offer, use Placeit marketing tools as part of your marketing plan. Mockup are easy to create, just drag and drop a screenshot of your choosing directly onto the HP screen in the template or click on the "Grab Screenshot From URL" button above the photo and type in the URL so Placeit can do it for you. Don’t keep your customers waiting, get custom marketing mockups from Placeit today and get back to business. This is a great mockup that features the LG G3 Smartphone in its full splendor, facing towards us and in an angled portrait position. A young woman is holding the black android device with her left hand as she picks some delicious french bread for the evening; she is wearing a navy blue scarf and we can see the interior of the bakery on the background. You can display your new android app or mobile responsive website within this mockup template to provide context to it and share its design and features in a clever way that will enhance your app marketing strategy. All you need to do is drag a screenshot of your app into the LG G3 and Placeit will deliver a beautiful image for you to share within your coworkers and even potential users to provide a use case in which your app looks stunning. Try it out right away! This iPhone 6 mockup provides an original, yet compelling environment in which you will be able to advertise your new iOS app and provide an insight on it to your consumer demographic. 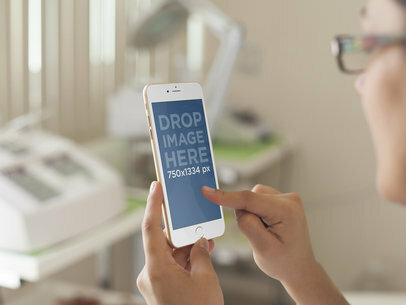 This iPhone 6 stock photo template features a young seamstress holding her iPhone 6 in a portrait position while taking measures on a beautiful blue night gown. Try this seamstress iPhone 6 mockup right away! Samsung S5 Mockup / Android Mockup of a Girl Shopping for Shoes. In this Android mockup / Samsung Galaxy S5 mockup, we have a girl smiling the high heel boots she is about to buy and her Samsung S5 mockup with your app in it. She holds the phone in portrait mode, allowing you to drop an image of 1080&#215;1900 px to get started. You can also input a URL and we'll show the website on the phone's screen. 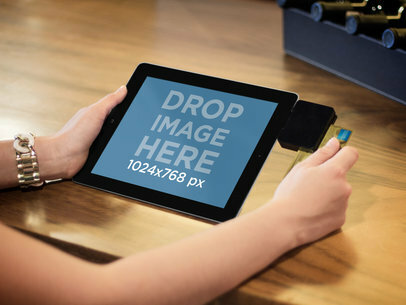 This iPad mock-up stage features an iPad with an attached billing device. A woman slides her credit card across the device. The iPad is in landscape mode, perfect for billing or commerce apps. You can grab a screenshot from any URL to display a website on this iPad mock-up. 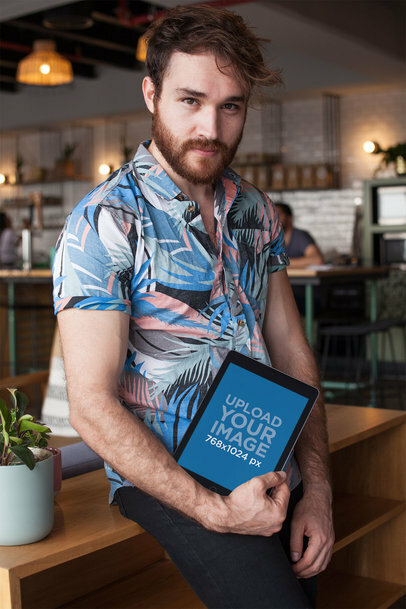 This tablet mockup features a bearded man holding a black Asus tablet in landscape position while at work, he is probably using an android app, and it could be yours! All you need to do is drag and drop your app's screenshot straight into the device and Placeit will deliver a compelling image for you to add to your app marketing strategy. Use this android tablet mockup right away and provide your potential users with a great insight on your app's design and features! This iPhone 6 mockup features a young lady comparing prices at the local drugstore. She is using her white iPhone 6 in a portrait position as she reads the labels on some products. This is the perfect scenario in which you will be able to display your new iOS app or mobile responsive website to provide your potential users with an insight on your app while being used in a real life situation. Try this iPhone 6 mockup template right away. Technology is making our lives easier one day at a time, and this beautiful tablet mockup provides a perfect example. 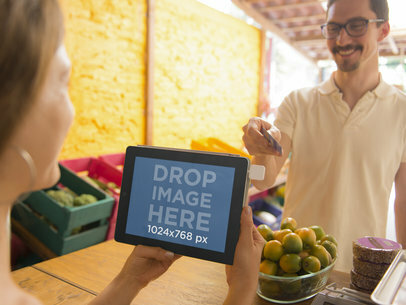 In this stock photo template we can see a young woman performing a purchase at a local business and the cashier is making the charge through a black iPad mini, which is connected to a small device that carries the credit card. This is a great iPad mockup in which you can showcase your new mobile payments app as a part of your app marketing campaign. Go ahead and use this tablet mockup right away to enhance your visuals. 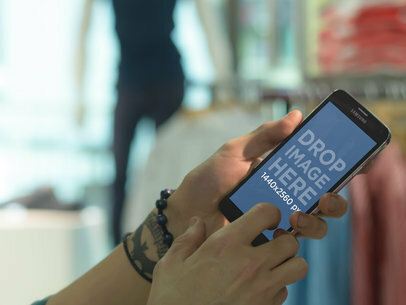 Use this iPhone 6 stock photo template featuring a young woman using her white iPhone 6 in a portrait position at a local boutique to introduce your new shopping app/website into the marketplace. This mockup could work perfectly for you to advertise your ideas and catch your potential users attention. Placeit stock photo mockups are really easy to use, all you need to do is choose an image of your new app/website and upload it onto the template of your choice to create a great visual asset for your visual marketing campaign. Keep in mind you can add text onto the negative space in the image to make it more attractive.